I'm counting there have already been done about one thousand and fifty two researches about coffee and its effect on our health. And, I guess, we can expect even more studies to be done. The outcomes will be different, conclusions will be misleading and, for sure, there will be even more companies willing to sponsor those researches. Because joe industry wants to make money - espresso machines, ground coffee dispensers, milk frothers, grinders, brewers, fancy cups and mugs, it all counts. So, one day we see a headline "Beware! Coffee rises blood pressure" and the other day we read that our beloved java is loaded with antioxidants. We think: "OK then, blood pressure is important but antioxidants come first"! So, we end up drinking coffee every day because it's a powerful substance and not many people can resist its addictive taste. It may be just a regular September day, nothing special, when we decide: "I quit coffee, let's see what happens". And it works out fine. So, unless you're completely hooked up and can't handle the day without 4-5 coffees, let's experiment! This positive change in my attitude happened overnight. I used to drink 1 small coffee in the morning, on weekdays. I'd thought I needed it to concentrate better and be more efficient at work. Well, that wasn't true. I can still think clearly now, when I don't drink java anymore, but what I noticed is that I'm definitely calmer and handle stressful circumstances better. Coffee No coffee Delay in production Another delay, everyday delay, why can't we manufacture anything on time, as promised?! Oh well, day like every other day. Difficult complaint This job's awful, there's so many complaints, why me, why? Let me just look out of the window and I'll take care of it right away. Rude e-mail from ungrateful customer I'm totally fed up, let me out of here, I'm done! Take a deep breath Joanna, we meet all those people on purpose. Another delay, everyday delay, why can't we manufacture anything on time, as promised?! Oh well, day like every other day. This job's awful, there's so many complaints, why me, why? Let me just look out of the window and I'll take care of it right away. I'm totally fed up, let me out of here, I'm done! Take a deep breath Joanna, we meet all those people on purpose. I noticed this change few days after quiting coffee. Before, when I drank this stimulant, my sleep was rather light. I used to wake up at night (or very early in the morning) and wasn't able to fall asleep immediately. As a result, I felt very tired in the mornings. Also, falling asleep took me about 20 minutes then. Now I sleep like a baby 😉 I fall asleep almost immediately after putting my head on a pillow and I don't wake up at nights. We all know the importance of good night's sleep so I think it's worth to sacrifice coffee for better health and younger looks. 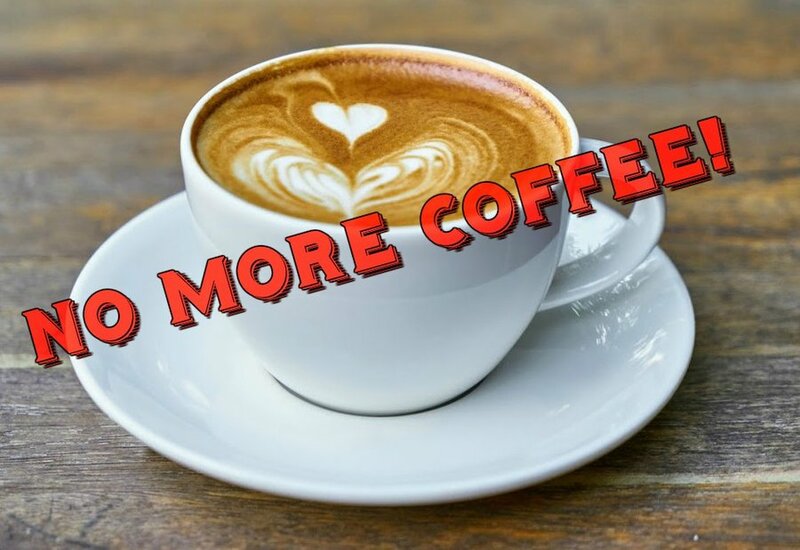 You may think "easier said than done" and you're right - quitting coffee was rather easy for me (wouldn't say the same about sugar!). I didn't use to drink coffee when I was teenager, I drank it first when I was about 19 years old and didn't like it. Then, I drank coffee very occasionally. Actually, it was this year when I started drinking it every day (I wish it was the same with sweets). So, my withdrawal symptoms were rather moderate . I experienced some mild headaches for 2-3 days after quitting coffee. I'm more sleepy in the evenings and after 9 PM all I think about is going to bed. I also have to admit I kept thinking about coffee in the mornings and was very close to having one on several occasions. But I knew that a few moments of pleasure weren't worth me being stressed out at work and unable to get good sleep at night. Now I'm definitely less attracted to coffee and don't feel tempted so much to have one in the morning. I think everyone should test non-drinking coffee on themselves. I know it's very difficult but only this way you'll know for sure what works for you OK and what needs to be avoided. Of course, a lot of attention and self-awareness is needed . Also, patience is required because positive changes usually take time, nothing happens overnight. I'm experimenting on myself with coffee because I've been confused about all those articles providing very contradicting information about health hazards (or benefits) of drinking coffee. Also, speaking with other people's experiences didn't give me much information. The majority of people are addicted to coffee and they aren't interested in any negative influence drinking java may have on their body. On the other hand, people who don't drink coffee are very reluctant to say why they don't do it, which is a bit strange to me. My conclusion is: if you want to know if something's good for you, test it ourself, your body will tell you what's right.